The Melbourne food nerd in me just about died of happiness when I opened the brand new 2010 Spring Collection cocktail menu at Der Raum on Monday night and saw that they're currently serving a cocktail named after Attica wunderchef (and recent recipient of The Age Good Food Guide 2011 Chef of the Year award) Ben Shewry. It's made with chilled umeshu, absinthe and fresh basil, which is fed into a bulbous beaker glass containing a thick stick of ice. 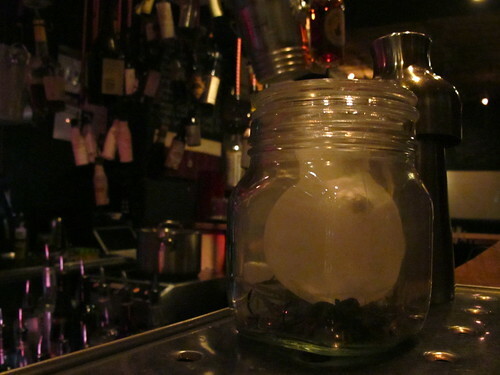 The beaker is itself placed inside a big gobstopper jar containing rosemary and star anise which, having been attacked by a handy blowtorch, are charred and smoking. The jar is then closed and the contents of the jar are given a few moments to smoke the contents of the beaker, in a method that echoes Shewry's famous dish of smoked trout broth with crackling, basil seeds and fresh smoke. And the taste? I'm not usually much of a fan of aniseed flavours, but I just loved it tempered with the sweet plum from the umeshu and the freshness of the basil. And loved that hint of smoke characters too! 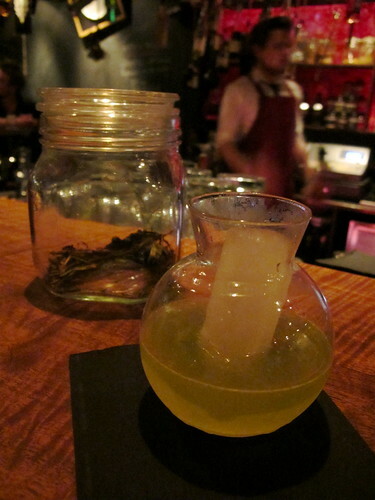 A few guys and gals from the Attica team were in on Monday night, to taste the cocktail. My cocktail companion, the lovely H, chose a different cocktail called Sausage Fingers. It contained CHIPOTLE AND MANGO TEQUILA, pressed lemon and agave, and tasted smoky and fresh and sweet and spicy all at once. Der Raum cocktails are not cheap (these two were $22 each) but boy oh boy do we love them. It was a Monday night and we'd promised each other we'd stop at one cocktail. But I'm keen as mustard to get back there ASAP to try the Midnight in Sicily: Averna, Campari, blood orange and Strega mist. Be still my beating heart! I can't help but think that 'Drinking Ben Shewry' is a bit unseemly.. it just sounds wrong. You definitely have your blogging mojo back! Um... So I *may* have accidentally found myself back there again last night... I had the Barney Banana, and - WOW! Served in an old-school sundae glass it was a big smooshy dollop of banana-y and cinnamon-y spiced nitro sorbet made from rum, laced with little bits of what tasted like burnt caramel toffee (I think it was dark palm) topped with delcious dehydrated banana chips (the menu said dried mandarin peel - although that might have been used to flavour the sorbet). 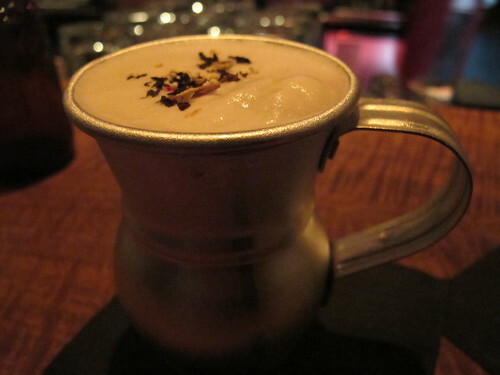 It was amazing, like a decadent grown-up banana-split sundae, delicious and with a fantastic mix of textures. 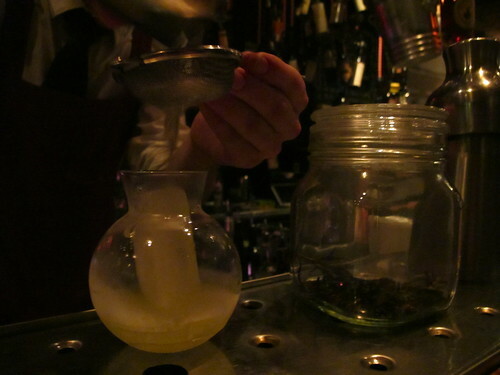 The Ben Shewry cocktail is great for the atmosphere of the bar - when we walked in the whole placed smelled of delicious smoky rosemary and anise. Nice review Claire - it's a great bar and deserves all the accolades it receives. 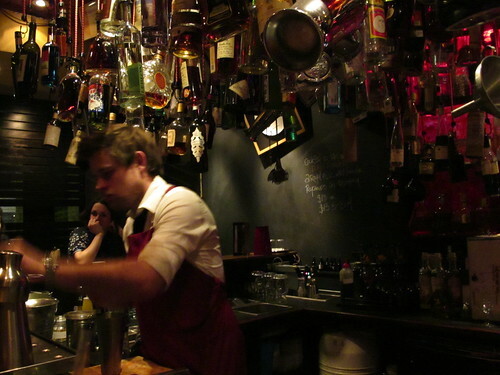 The 'hanging gardens of alcohol' above the bar is truly something special, and almost worth the visit alone. But add the cocktails in and you have a damned good night to remember (or not, depending on your budget!). Cocktails have come a long way! 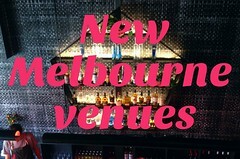 My favourite bar, and now I want one of those Ben Shewry cocktails! i wld b happy to live your life one day!? Der raum looks brilliant...I have heard about it but happy to live thru your blog right now considering i am over 1000km away. "not usually much of a fan of aniseed flavours"??? Hannah you went back without me??? But thanks for reporting back about the Barney Banana! Thanks Chris - the hanging gardens of alcohol are one of my favourite features of the bar too. You are definitely one of the best food blogs i've seen lately. 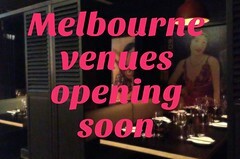 I live in sydney, so I am putting you in my "cool blog" listing . That is hilarious... ahahha.. Drinking a Ben Shewry sounds really wrong.. but it seems worth it?? One issue with Der Raum though... no espresso martinis! Sometimes a girl just really needs a caffiene kick in her cocktail!